It has been slightly over two years since my cancer was diagnosed, after which I underwent the rigours of chemotherapy, a stem-cell transplant, and making that slow recovery that enabled my donor’s stem cells to be fully engrafted into my own marrow. I had a couple of close calls where pneumonia was something of deep concern to my doctor, with some bacterial infections and Graft Verses Host Disease issues along the way. But it is with great joy that I was given the green light to get back to ministry work and began my parish involvement over the recent weekend. It was a strange combination of joyful anticipation, coupled with a bit of healthy anxiety. It did seem like a strange confluence of similar circumstances that I read only last week on Fr Ronald Rolheiser’s weekly blog that he too just began to re-enter into his routine of teaching and lecturing after a hiatus where he himself underwent therapy to treat his cancer which had relapsed. One could easily detect that Fr Ron was effusive and enthusiastic about putting his talents to good use, but was also very honest about how he was not too sure if being useful was something that pandered more to his own ego needs than if it was something that clearly gave God glory. I think it would be overly simplistic to make it entirely an ego issue, and wishful thinking that at every level of our lives that we are ready to say that we do things all for the glory of God. The truth is more that most of our best intentions are a mixed bag, and we purify our motives along the way. I am also of the opinion that plunging headlong into the thick of parish life and its activities would be a sure recipe for the rising of stress levels in anyone recovering from something as debilitating as a cancer treatment. I’d like to say with a sense of conviction that cancer has mellowed me somewhat and that I am beginning to take things easier, but with almost 50 years of life behind me, I also do realise that it may take a bit more than a cancer experience to really take things in a slower and deliberate way. One of the things that I have come to appreciate is the ability to let go of my plans and aspirations. It is now no longer possible for me to continue the pursuit of my teaching license that I set out to attain when I went to Washington DC three years ago. I am not physically able to live outside of my medical coverage and care which I am getting here in Singapore for any prolonged period of time, and I am also no longer insurable. In truth, what I had been forced to live out is the reality that man can propose, but it is ultimately God who disposes. But what I can say for certain is that there is not a hint of bitterness or regret for what had taken place. I am still very grateful for the entire experience of this illness which has given me a very rare and beautiful opportunity to fully rely on God’s grace and providence, and I am strangely confident that this will put me in good stead to minister to the infirm with an effectiveness that results from a personal experience. 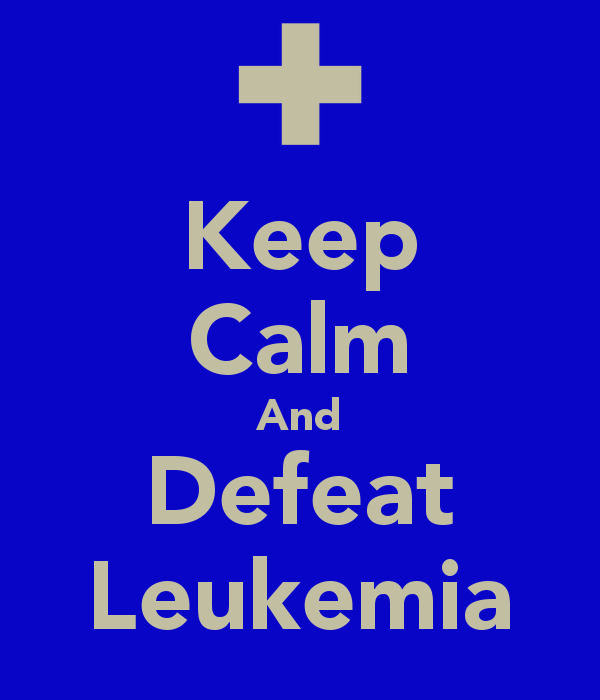 Going to the hematology centre at the hospital on a regular basis during my ongoing treatment and being monitored closely for signs of rejection and other health issues, I have been privileged to befriend quite a few fellow leukemia patients. It was with a great sense of foreboding that I learnt just last week that one of them had just been told that she had a relapse of the illness and that new blasts were found in her blood. Only 25 years old, this feisty and very cheerful young woman chose not to pursue being treated with chemotherapy drugs as it is her third relapse. What struck me was the peace and calm with which she handled this. When I thought about my path to recovery in the light of her own relapse, I couldn’t help but feel a tinge of guilt that my transplant had been largely successful, and that hers seemed to be an ongoing struggle. Just as there is no reason why we get blood cancers, I suppose there are also no clear reasons why some transplants work well, while others encounter problems that seem insurmountable. Much as I have learnt to let go of unfulfilled dreams and hopes, perhaps what needs to be learnt at a deeper level is that I need to learn to let go of any feelings of guilt of recovery in the light of the continued struggle faced by other patients in similar situations. Lent is commonly seen as a time of great grace, and for me, this is particularly true as I re-enter into ministry in Lent. I only pray for the continued grace to live in a way that truly glorifies God with the gift of my new ministry. I know that many people had been instrumental in praying for my recovery, and want to use today’s reflection to thank all who have prayed so fervently for my improved health. Praise be to God!! What wonderful news to know that you are back full-time. In spite of the set-up of not being able to continue with your studies, please know that you have blessed many of us with your deep insights and reflections through this blog; God-given gifts and I am sure the good Lord will continue to use you as HIS instrument for HIS greater glory! Welcome back to the community!! His ways are not our ways. But we know He is ever loving and faithful. Thanking God for ur recovery. Thank you also for sharing this personal testimony. Dear Fr. Luke. It is good that you are able to return to active ministry again. As always, I pray for your return to complete health and strength. But perhaps, on the other hand, this episode (your struggle with cancer) has strengthened you in other ways; made you stronger, more resilient (though maybe not visibly). I believe that although so much has been taken from you, much more will be given in return, for God blesses His faithful: although not necessarily in ways we would expect or even dream of. God bless! This is indeed wonderful news and thanks be to GOD! We look forward to your full-time ministry and wish you good health and God's grace be with you always! Welcome back Fr Luke!! With grateful thanks to GOD for your recovery and back to full-time ministry. Even though you have had to discontinue your licentiate, HE has other plans for you. Praise the Lord. I also read with much joy that Fr Rolheiser, like you - has returned to full ministry after his bout with cancer which he jokingly termed his period of ‘house-arrest’. And his honest and thought-provoking reflection on whether his burst of joy and energy at this return to health and ministry was more due to ‘narcissism/pride’ or ‘doing it to give God glory’? The Gospel story of the healing of Peter’s mother-in-law in the three Synoptics all agree that once healed, she did not waste any time but “promptly rising up, she ministered to them.” It would seem that her one desire was to use her newly restored health - to be of service to others. Shouldn’t this also be our way of using the gifts and mercy of God? You are a blessing to so many of us who hear and contemplate your thoughts and messages - thank you! God has gifted you with teaching, discernment, compassion and leadership, and His restoration of your health has allowed you to return (were you really ever far away?) to your congregation. I am touched by your reflections of who God is in all of our lives, and am fortunate to call you my blood brother, but more importantly, my spiritual brother in this life's journey. When one door closes, another will open. God Bless you Father Luke. Off and on I read your blogs. Sometimes in succession because time is short. Keep writing! And keep reaching out the way you do like a virtual beacon of God's light for wayward travellers like myself! Seeking perfection - do we, or don't we? Emptiness and the spiritual life.